Superferry Promo for the BER months! Superferry Promo Fare- Welcoming the BER months with SUPERB events and promos!!! 2GO Travel to join the Philippine Travel Mart from Sept. 6-8, 2013 at SM Mall of Asia Convention Center. Travel date of tickets to be sold: Sept. 15- Dec. 15, 2013. 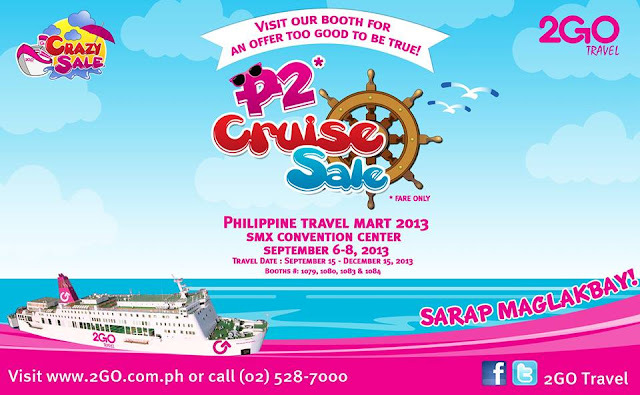 Visit our booths 1079,1080,1083 and 1084 to avail of discounted fares and packages that will suit your budget. Exciting games also await you at this event. Selling of Supercat tickets will also be available. P.S. : When you call to inquire, please mention you got the promo info through facebook.